The mapping of the canine genome and the study of canine breed genomic architecture has revolutionized the discovery of genetic tests for inherited disorders in dogs. As the genetics underlying complex disorders are revealed, canine breeders and their registering organisations will be required to understand genetics in a much more sophisticated way. 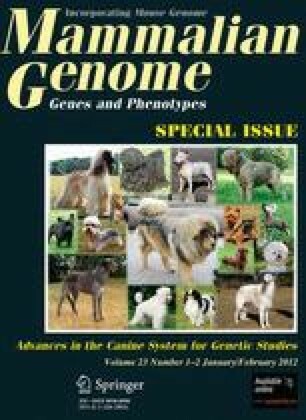 To facilitate the management of genetic disorders in the era of new complex information, we consider how best to apply the results of new research and analytical techniques to benefit the wider canine breeding community with the aims of improving canine health and maintaining benevolent genetic diversity. If this is not done, there is a serious risk that expensive and valuable genetic research will remain unused or be misused to the detriment of breeds. In this review, we make a case for the formation of an international organisation that will exist as a central repository for breed-based genetic analysis and information sharing. This organisation (“Inter-Dog”) could be modelled on a similar organisation that is monitoring genetic improvement of dairy cattle. The formation of such an organisation will require the collaboration of international kennel management organisations, researchers, and agencies offering genetic testing services. The authors gratefully acknowledge the constructive comments offered by Emeritus Professor Frank Nicholas on an early draft of the paper.